Space is also sometimes called outer space. It is the dark and starry place beyond Earth. The planet Earth is in space, just like the Sun and the Moon. Even though space looks like it is full of stars, it is really quite empty. The distance between stars in space is very far. Many interesting things are found in space, such as planets, stars, galaxies, nebulas, asteroids, and comets. 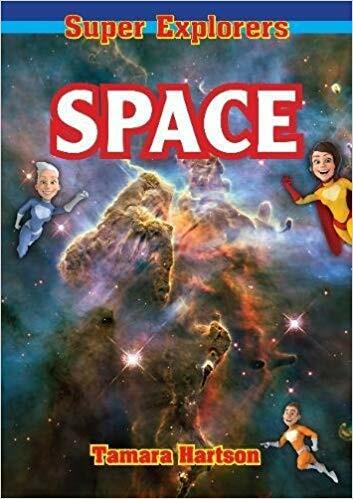 Space is one of the books in the juvenile nonfiction “Super Explorers” series. As a group of cartoon superheroes explore outer space, they teach readers facts about the planets and their surrounding features (stars, moons, galaxies and constellations). Although these facts also appear (sometimes word for word) in another book in the series, Night Skies of Canada, this book includes new information not found in that book, such as information on astronauts, the Mars Mission, the Space Station and Shuttle, and the Hubble telescope. With no table of contents, index, glossary, or visible page numbers, this book can be hard to navigate if the reader is looking for something specific. The contents do not follow a story though, and so it’s the type of book that can be read in sections at a time and in any page order. Most of the superheroes wear spandex, gloves, and capes, but the two who stand out are the one who wears glasses and the one who has a ball cap on his head. Because the artwork consists of photographs appearing against colourful borders and backgrounds, the pages are eye-catching and help exemplify what the text is trying to describe. Space could be used as a part of a class project or for general interest. Tanya Boudreau is a librarian at the Cold Lake Public Library in Cold Lake, Alberta.